For Acura buyers interested in the all-new 2014 RLX, the car will become available much sooner than expected and the premium brand has announced manufacturer's suggested retail price (MSRP) starting under $50,000. 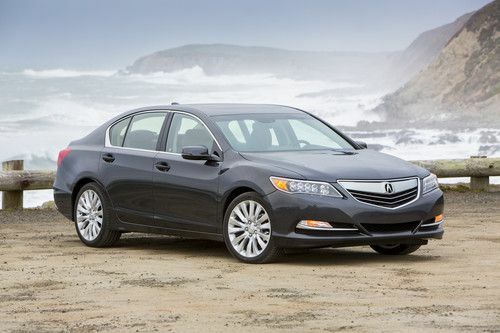 The all-new 2014 Acura RLX sedan is the flagship for Honda's premium brand and will debut across Acura dealerships on March 15 of this year following a national "Destination RLX" client experience program meant to showcase the car in its new edition. The RLX will have a price tag starting at $48,450, not including destination charges, to go with its boast of having the most spacious passenger cabin in its class. Two new things most drivers and observers will notice right away are the all-new and industry-first Precision All-Wheel Steer™ and Acura's signature new JewelEye™ LED headlamps. Also new for this model year is the direct-injected, single overhead cam (SOHC) i-VTEC six-cylinder engine putting out 310 horsepower - the first time Acura has utilized direct-injected engine architecture with Variable Cylinder Management, which can deactivate the three rear cylinders to improve fuel economy at speed. Acura predicts that this plus the new light weight body design will result in EPA ratings of 20 in the city, 31 on the highway and 24 miles per gallon overall. This would give it a class lead in fuel economy, though official EPA test results have not been confirmed for the new RLX. The interior of the 2014 Acura RLX boasts the longest rear-seat legroom, longest tandem seating distance, and widest front and rear shoulder room in the mid-luxury class, making the inside of the mid-sized RLX more akin to a full-sized sedan experience. Changes to the chassis were also made and include the first time application of the company's new Acura Precision All-Wheel Steer™, which gives higher low-speed maneuverability and more controlled high-speed handling. P-AWS gives independent and continuous control of the left and right rear-wheel toe angles, which enables more nimble cornering with reduced tire drag as well as a tighter radius for low-speed turns. This technology is a first in the industry and is available on all RLX models. Interior upgrades include the next-generation of the AcuraLink cloud-based connected car system, which includes the new version of AcuraLink Real-Time Traffic, now including surface street information. Standard safety technologies include Lane Departure Warning, Forward Collision Warning, and Acura's Advanced Compatibility Engineering body structure. Driver's knee airbag and a full array of cabin airbags complete this while the available Collision Mitigating Braking System improves active safety measures. Five package options, all increasing in technology features, are available for the RLX, starting at $48,450 for the base trim and moving upwards to $60,450 for the RLX with Advance Package. Prices do not include destination. An optional all-wheel-drive (Sport Hybrid AWD) trim boosts the RLX's horsepower to 370, and averages fuel economy to 30 mpg combined. This package will be available later in the year and a yet-to-be-announced MSRP.